LEAF Open Farm Sunday, managed by LEAF (Linking Environment And Farming), is one of the farming industry’s biggest success stories. 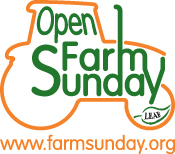 Since the first Open Farm Sunday in 2006, over 1000 farmers across the UK have opened their gates and welcomed people onto their farm for one Sunday each year. It is a fantastic opportunity for everyone, young and old, to discover at first hand what it means to be a farmer and the fabulous work they do producing our food and managing the countryside. Record visitor numbers in 2018! Visit a farm on LEAF Open Farm Sunday on 9th June 2019 and discover the world of farming. Find out about the story behind our food and how farming affects our everyday lives. Each LEAF Open Farm Sunday event is unique. Activities range from machinery displays, tractor and trailer rides, through to demonstrations, nature walks and much more!